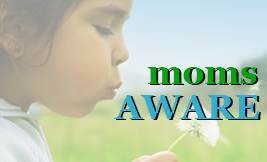 moms AWARE - Where Do I Begin? Home > Where Do I Begin? You suspect mold in your home. Someone in your family has symptoms that baffle doctors. Where do you begin? If your symptoms are severe, consider leaving the environment to see if you feel better. If your symptoms improve, testing your home for mold is the next logical step. It's important to test your home before cutting into any drywall or lifting any carpet. Disturbing the mold spores can make a situation much worse. Preliminary testing can be done with a simple moisture meter (pictured at left) obtained from a local hardware store. 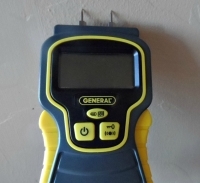 Place the probes in a suspected wall to see if hidden moisture is present. There are several options for testing. Mold plates found in hardware stores do not "pull" the air and therefore provide only a limited picture of your air. A toxic mold issue can easily be missed when using this product. Initial testing can include an ERMI (Environmental Relative Moldiness Index) test, which involves a dust sample. Labs that offer this service include EMSL Analytical, EMLab P&K, EnviroBiomics, and Mycometrics. For more information, see our article on ERMI Mold Testing. Mycometrics offers the simplest form of ERMI testing, using a dry, Swiffer-type AccuCloth Kit. Their 36-species mold test costs $290 including shipping. They also offer a 5-species HERTSMI test, also utilizing an AccuCloth Kit, for a cost of $155. momsAWARE is pleased to offer both these tests through our Online Store. Another testing option is a tape sample, which can be used if the mold is visible. EMLab P&K charges $30 per sample, with a $50 minimum. Visit their website to find out more. A third option is an air test, which is less optimal than a dust or tape sample. However, when taken in conjunction with dust samples, it can still be a valuable tool. Do you believe mold is harmful? The answer must be yes. What constitutes a "safe" level of mold? In an air sample, mold counts should be equal to or below outdoor counts. There should be no stachybotrys. Not one spore. Aspergillus should be present only at negligible levels. The standard in Belgium requires no more than 2.5 percent aspergillus in the total count. Can I see the report? Do not rely on a hygienist's word. It's important to see your counts for yourself, especially when assessing the levels of aspergillus. The cost associated with mold testing is often a stumbling block, but it can save you thousands of dollars later. Precautionary testing before buying a home may prevent even greater financial loss. It can be difficult to find a physician who understands toxic exposure. The American Academy of Environmental Medicine has a list of doctors who may or may not be familiar with toxic mold. The American Board of Environmental Medicine is preparing an Internet list of physicians. Another option is the Institute for Functional Medicine. The website Surviving Mold offers this list of physicians specializing in the treatment of biotoxin illness. If you have a primary doctor willing to consider mold exposure as a cause of illness, ask for specific lab work such as C4a, VEGF, MSH, and leptin. Or ask for the full set of labs. Alternative health care offers a wide range of diagnostic and detox options, as well. The mold journey is a daunting one, but knowledge is power. It is better to deal with mold than ignore it. Some stories are extreme. 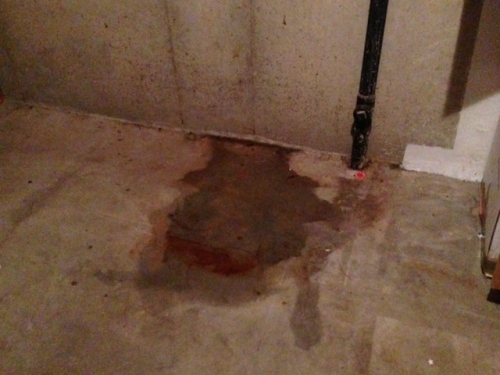 Some have a happier ending, where mold was suspected, testing was done, and remediation was performed successfully. No one got sick, because the mold was dealt with quickly and thoroughly. And in some cases mold was suspected, testing was done, and nothing harmful was found. When the possibility of toxic exposure exists, it's much better to choose knowledge. Although it may prove to be painful, with truth, there is freedom.